It took a while, but by now it seems like people are aware that they might be eligible for significant subsidies to help cover the cost of premiums under Obamacare. 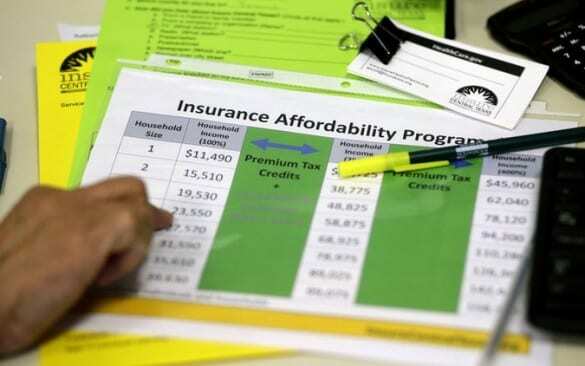 For most people, the way these subsidies are calculated is a mystery, and usually that’s fine– when you shop for coverage on healthcare.gov it will just tell you, or you can use a tool like the Kaiser Family Foundation’s subsidy calculator to see what you’d pay for coverage. But lately we’ve been getting some questions that are a little more complicated. Some young people are wondering why they don’t get a subsidy, even though their income should be well below the eligibility threshold. Others are wondering why people with the same income are getting vastly different subsidies. If you want to know the answer to these questions, you need to know how the subsidy works. And warning: there will be math. If the price of the second cheapest silver level plan where you live is more than the percentage of your income in the chart above, the government will pay the difference– that’s your subsidy. Here’s an example: let’s say you make $15,000. Under the Affordable Care Act the most you’d pay in premiums for the second cheapest silver level plan is 2% of your income, or $300 per year. So if the second cheapest silver plan in your area costs $2,000 per year– you’d get a $1,700 subsidy to cover the difference. But you don’t have to use that $1,700 on the second cheapest silver plan– you can take that credit and apply it to any plan on the exchange (except catastrophic plans). Say you find a bronze plan for $1,600– you can apply your $1,700 subsidy and pay $0 in premiums (but sorry, you don’t get to keep the $100 leftover). Or you could apply that $1,700 to a more expensive gold or platinum plan. Remember that you only get a subsidy if the second cheapest silver plan costs more than a certain percentage of your income, on that chart above. For some young people, the silver plan will cost less than that, even without the subsidies. For example, if you make $35,000 per year, Obamacare says the most you’ll pay for that plan is 9.5% of your income– $3,325. In Pittsburgh, where insurance is cheaper, the cost of the second-cheapest silver plan for a 32-year old is about $1,900– way less than the Obamacare limit for someone making $35,000, so no subsidy. In fact for some 20-somethings in Pittsburgh, insurance is so cheap that the subsidies don’t kick in unless their income is below $26,000. There are two reasons: location and age. Location: Since your subsidy is pegged to the price of insurance in your area, if insurance costs more where you live, your subsidy is bigger. For example, in Philadelphia, just across the state from Pittsburgh, insurance is much more expensive: for a 32-year-old in Philly, a silver level plan would cost $3,200 without subsidies. So that same young person making $35,000 that didn’t qualify for a subsidy in Pittsburgh would actually get a small subsidy in Philly. Age: Insurers aren’t allowed to charge more for pre-existing conditions, but they are allowed to vary premiums based on age– they’re allowed to charge an older person up to three times as much as they charge the youngest person they cover. So while a silver level plan would cost a 28-year-old $1,700, for a 61-year old it would be almost $4,500. If they both made $35,000, the 28-year-old wouldn’t get a subsidy, while the 61-year old would. The idea is that at similar income levels, everyone pays roughly the same amount, but there can be a lot of variation between ages and location, especially as you move up the income scale– in that last example, even with the subsidies, coverage is over $1,500 cheaper for the younger person. It also means that there can be a huge increase in the price of coverage for older people making just over the 400% of the FPL eligibility limit. Take Philly again: there the cost of a silver level plan for someone in their 60’s is almost $8,000. If you make just under $46,000 you qualify for a subsidy, so you’d pay only 9.5% of your income, that’s less than $4,500 per year, for silver level coverage (and of course less for a bronze level plan). If you make just over $46,000 you have to pay the full $8,000– 17% of your income. That’s why some have suggested there should be some extra help for older Americans who just miss the subsidy cut-off. Keep in mind that all these numbers on income level and premiums are based on the estimates provided by the Kaiser Family Foundation– they should be very close to what you’ll see on healthcare.gov, but might not be totally exact. And remember that you don’t have to know all this– healthcare.gov will figure it out automatically, so the price you see when you apply for coverage will include the subsidy. But given the earlier problems with the website, it’s good to have at least a rough idea of whether the price you see is accurate.